Indeterminate. Regular leaf. 85 days. The most beautiful tomato in the garden this year and we thank Mr. Mike Owen for sharing this cross between Paul Robeson and Mortgage Lifter made by Jinnie Farrell . Uniform ripening with no green shoulders, the color is something behold: intense dark purple fruits glowing with deep ruby undertones, are smooth shouldered and grow large . Indeterminate. Regular leaf. 85 days. 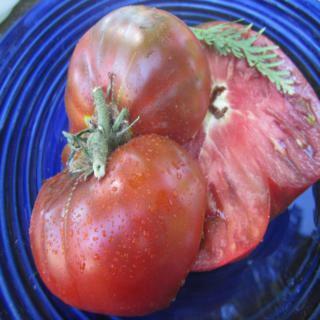 The most beautiful tomato in the garden this year and we thank Mr. Mike Owen for sharing this cross between Paul Robeson and Mortgage Lifter made by Jinnie Farrell . Uniform ripening with no green shoulders, the color is something behold: intense dark purple fruits glowing with deep ruby undertones, are smooth shouldered and grow large . A cut above most dark tomatoes, these superior flavored tomatoes are juciy with complex flavors that will delight anyones taste buds. We LOVE this one! *Limited quantiies, so order early.